Nanoparticles have unique properties due to their small size. All nanoparticles regardless of their chemical constituents, have surface area:volume ratios that are extremely high (see the following table). Thus, many of the physical properties of the nanoparticles such as solubility and stability are dominated by the the nature of the nanoparticle surface. While high surface area to volume ratios are important for applications such as catalysis, the actual properties of silver are different at the nanoscale. For example, the plasmon resonance of spherical silver nanoparticles results in the particle’s exceptional ability to scatter visible light. 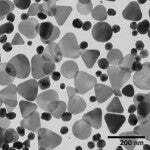 Silver nanoparticles can be produced with various sizes and shapes depending on the fabrication method. Silver spheres, rods, wires, and plates can be produced by varying the manufacturing method. Typically anisotropic shapes are formed in the presence of a stabilizing polymer that preferentially binds to one crystal face and results in one crystal direction growing faster than others. 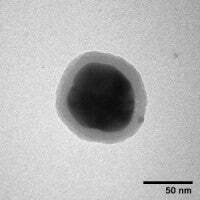 However, even “spherical” silver nanoparticles can have a range of shapes and sizes (see the figure below). One of the benefits of nanoComposix’s silver nanoparticle formulations is there are relatively few highly faceted silver nanoparticles resulting in less variation between the optical properties of each nanoparticle. One of the most common questions that we receive is “What is on the surface of your nanoparticles?” In solution, molecules associate with the nanoparticle surface and these surface bound molecules establish a double layer of charge that prevents nanoparticle aggregation. 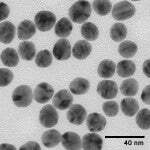 NanoXact and Biopure silver nanoparticles are capped with citrate, tannic, or PVP. Citrate weakly associates with the nanoparticle surface, and is often used because the weakly bound capping agent provides long term stability and is readily displaced by a range of other molecules including thiols, amines, polymers, antibodies, and proteins. Tannic acid is a multidentate capping ligand that can be displaced with many thiol containing molecules. Tannic acid is often used as a capping agent in applications where high particle concentrations are required. Polyvinylpyrollidone (PVP) is a polymer that binds strongly to the silver nanoparticle surface. It provides greater stability than citrate or tannic acid capping agents, but is more difficult to displace. It is important to remember the surface of most nanoparticles is dynamic and is strongly influenced by the local environment. Different conditions will affect the particle in different ways. High salt environments will collapse the double layer and cause nanoparticle aggregation. Proteins and other biomolecules will often associate with and stabilize particles. When working with nanoparticles you must anticipate changes to the surface and plan accordingly. For example, when nanoparticles are to be added to solutions used in-vitro and in-vivo experiments, it is best to expose the particles to a low-salt solution that contains the protein components of the media and then add salt to bring the solution up to isotonic conditions. The protein binds to the particle surface and the suspension remains stable. If the nanoparticles are added directly to a high salt buffer, the particles may aggregate before protein stabilization can occur. At nanoComposix we have experience fabricating particles with specific surface states, exchanging one surface for another, and constructing multiple layers of different surface molecules or shells on various nanoparticle cores. For more information please visit our Custom Synthesis page. 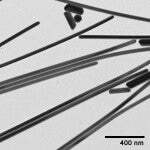 Preventing nanoparticle aggregation can be very challenging depending on the application. Nanoparticles are either charge stabilized or sterically stabilized. For charge stabilized particles, the zeta potentialis a measure of the particle’s stability. Typically, nanoparticles with zeta potentials greater than 20 mV or less than -20mV have sufficient electrostatic repulsion to remain stable in solution. However, it is important to keep in mind that the surface bound molecules on nanoComposix’s NanoXact and BioPure silver nanoparticles are easily displaced, and the zeta potential is highly responsive to other molecules or contaminants in solution. An unwashed pipet tip may introduce sufficient material to displace the ionically bound stabilizing molecules and destabilize the particles. Silver nanoparticles are also susceptible to light (especially ultraviolet light) and should be stored in the dark. Highly acidic or basic solutions can also increase the dissolution rate of the nanoparticles into an ionic form that can plate onto the sides of the container or re-deposit onto existing nanoparticles changing the average diameter and size distribution. Due to the unique optical properties of silver nanoparticles, particle stability can be accurately tracked with UV-Visible spectroscopy (see Optical Properties for more information). Silver nanoparticles can be functionalized with a wide range of materials. Polymers such as polyvinylpyrrolidone (PVP) and tannic acid are commonly used capping agents for silver nanoparticle materials applications. Silver nanoparticles used in biological applications are commonly coated with polyethylene glycol (PEG), bovine serum albumin (BSA), or numerous other proteins, peptides, and oligonucleotides. Particles can be functionalized with molecules that 'flip' the surface charge of the negatively charged silver nanoparticles to a positively charged surface. Particles can also be functionalized to provide reactive groups (for example, amine- or carboxy-terminated surfaces) for subsequent conjugation by the customer. Dielectric shells (for example, silica, aluminium oxide, and TiO2) with a precisely controlled thickness can be used to encapsulate the particles, change the optical properties, or incorporate a fluorescent layer. NanoComposix provides a wide range of custom modifications to nanoparticle surfaces. Different commercial vendors report concentration using various methods. When researching which nanoparticles to purchase and use it is critical to be able to compare formulations from different suppliers. There are a number of different ways that the concentrations are reported. Here we provide tables converting our silver nanoparticle formulations into other commonly reported concentration units. At nanoComposix the mass concentration is measured using ICP-MS and UV-Visible spectroscopy.